This weeks writing challenge from WordPress was to do something you haven’t done before on your blog: if you write fiction, write a poem; if you write nonfiction, write fiction; if you use one photo, try out the gallery….do something different. I’ve been getting a nudge to write about cooking. Food is one of those process things…and it’s spiritual too. When I cook, I cook with love. And I cook to please my family, to make the end meal of the day something special. Cliff cooks with the same intent, only his love is cooking on the grill and mine is trying something different. Tonight, I decided to make risotto to go with a chicken dish. It’s fabulously good, it’s fun to make, and my family loves it. 1 c. of Italian style rice. Usually the label will have something on it about risotto. It’s a heavier grain that absorbs a lot of liquid. 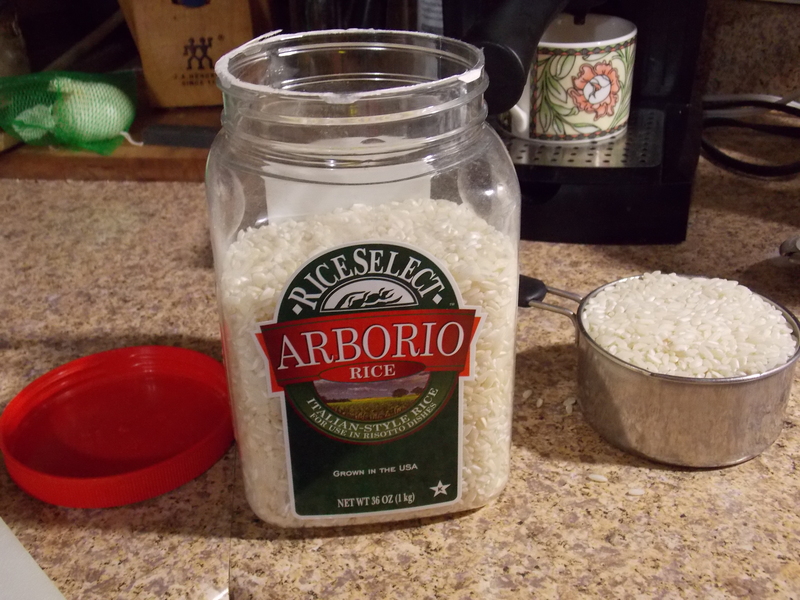 I like Arborio Rice. 2 t. of oil and 2 of butter. I don’t always add the butter but you can. 3 cups chicken stock or vegetable stock. I use bullion in water but a special bullion. You can add salt and pepper but I don’t usually as the chicken bullion stock is already salty. 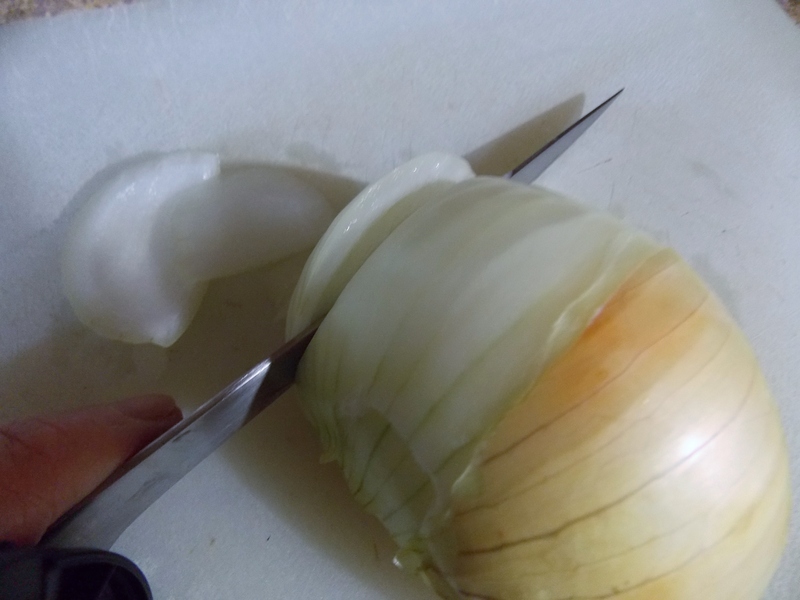 I suspect anyone who cooks knows how to cut up an onion, but this was a pretty cool shot, so I used it. 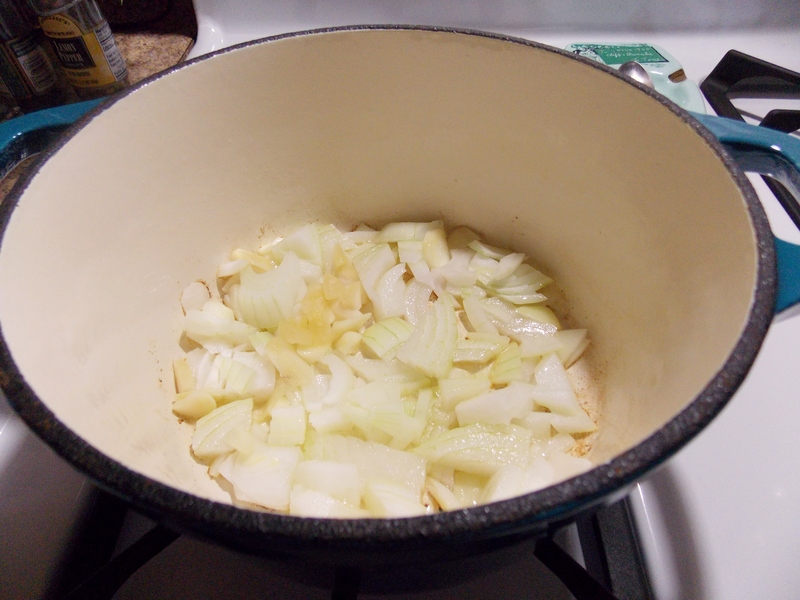 I like using sweet onions, those big fat ones with the yellow skins. 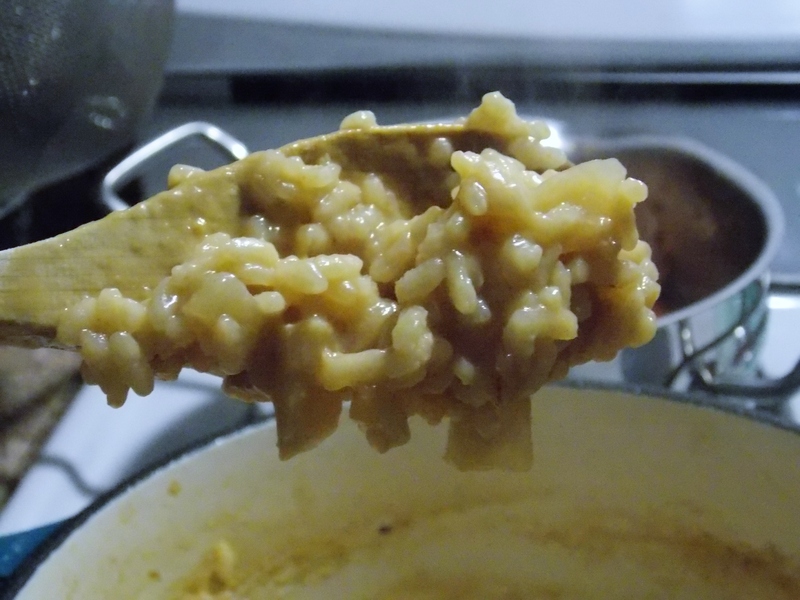 Another reason I like making risotto is cooking it in my porcelain-coated cast iron pot. What genius thought of porcelain over iron? 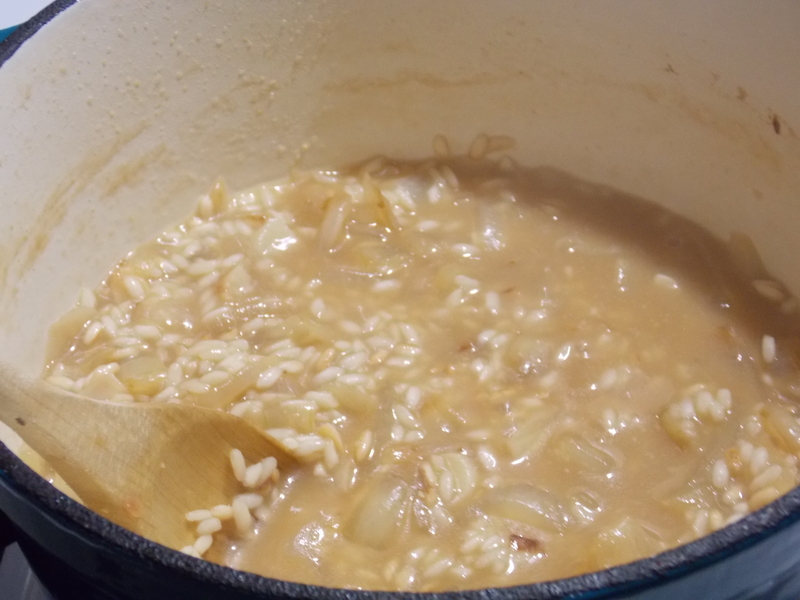 And then after cooking the onions a bit – last night I also added a couple of cloves of garlic – you toss in the cup of rice and brown it all together for a couple of minutes – let’s say 2 to 3 for those who need specifics. 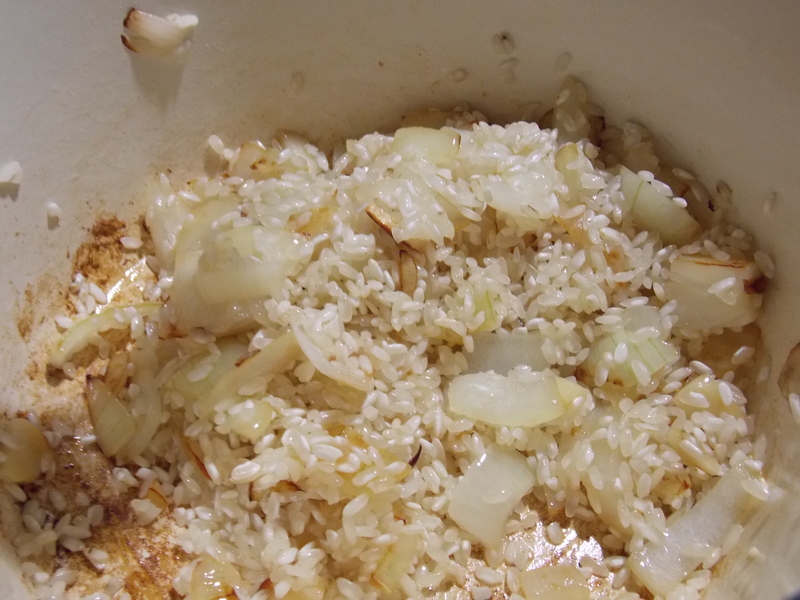 Browning rice and onions/garlic. See how nicely they do in a great pot? All the while this is going on, I heat water in the teakettle so I can dissolve the Better Than Bullion chicken broth concentrate. It really is better than bullion cubes and has a great taste. And it’s always on hand. A tablespoon or so of bullion mix and two cups of water. The recipe calls for a total of three cups, so after adding the first cup of water, I just fill the cup again. Okay. Now it’s time to pour a cup of the hot bullion water into the rice and stir. And stir. You don’t really have to stir it constantly, but you do have to pay attention and get back to it often. Just stir. It might be nice not to have to multi-task for a short time anyway. And after you’ve stirred for awhile, it looks like this. Then add another cup of bullion, stir again until it looks like this, and add another cup and do the whole process again. 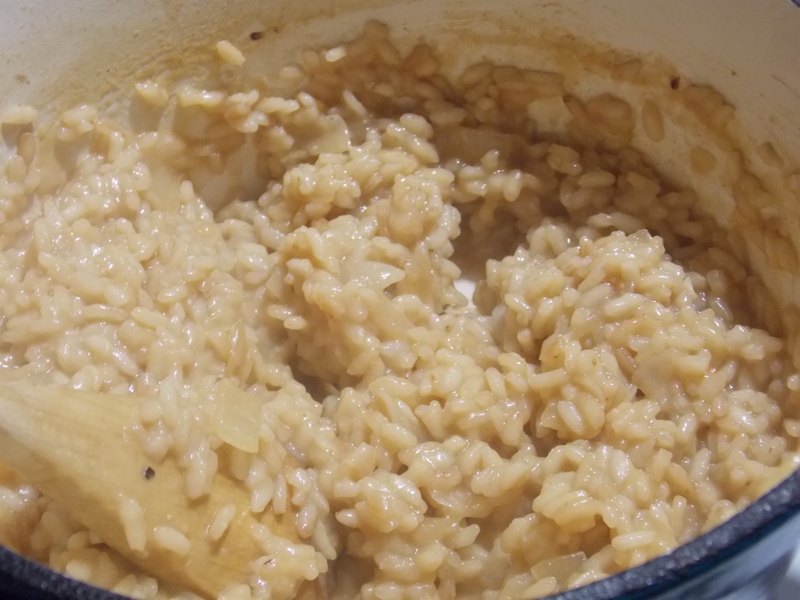 Finally, all three cups of liquid are absorbed and the risotto will look something like this. Test (take a bite) and see if the rice is soft. It might need a little steaming time with the lid on or you might need to add a little more liquid. Until it looks like this on the spoon. And there you have it: restaurant grade risotto at home. From start (heating the oil) to finish (eating) it takes about 45 minutes. As I said, patience and persistence. I love risotto and will have to try this recipe! Do you ever add chicken or shrimp? Thank you. I’ve not added them but I expect it would work well. Something else that might work well is andouille sausage. Blue Stem does a fabulous dish with the sausage and shrimp over grits, so maybe the same thing in risotto would work. Great idea. Thanks! Hi, old buddy . . . Your risotto recipe is pretty much how he did his risotto with one exception: he added some good dry to semi-dry white wine. After browning the rice along with the onions, he put in about a half cup or so of wine. After that was absorbed by the rice he started with the stock, gradually adding and occasionally stirring until it was all incorporated and the rice was creamy. By that time the alcohol in the wine had cooked off, but had imparted its flavor to the mix. My only suggestion is to use homemade chicken stock. All the commercial boullions and/or concentrates are loaded with salt and msg. The broth produced by a couple of soup chickens will go a long way, has a superior flavor, and is healthier to boot. I got into the routine of cooking up a couple of liters every so often and freezing it in various forms (one cup lots as well as in icecube format for those recipes that just call for a few TBS of stock). Easy to do and it sure makes the kitchen smell lovely while it’s simmering. Hugs and best wishes to you and your family. Thank you Grandpa Cleto. Wine! Of course. I love it. And will begin adding it. As for the bullion, this particular brand doesn’t have MSG although it does have salt. But I’d have to add salt to rice anyway and don’t this way. Yes, I’d agree that making fresh stock and putting it in the freezer is best. And sometimes I do. But then I forget it’s in the freezer and I end up with very old frozen stock! I keep vegetable stock in there and use that “most” of the time. 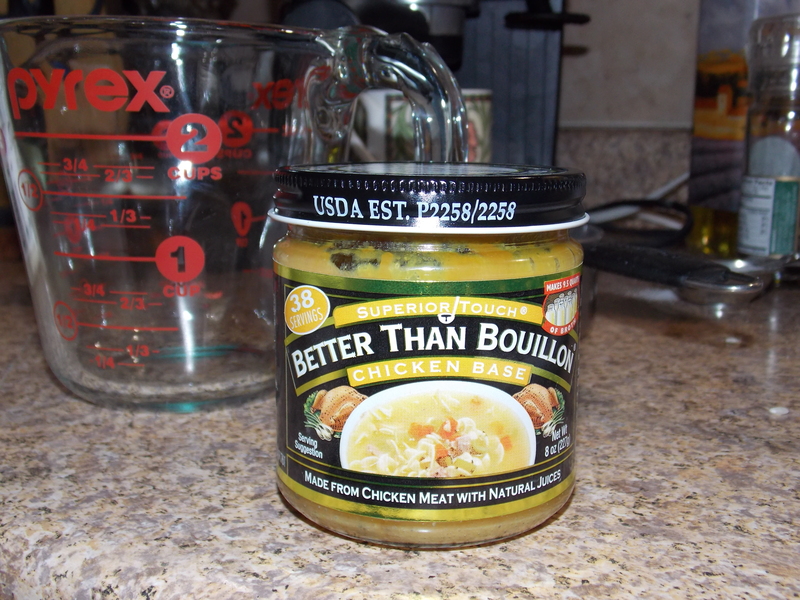 I once had seafood stock in there until …. well, too long. Maybe someday when I have fewer things to keep track of, I’ll switch!! BTW, just got a contract for a poetry book. It’s a big time yea! but now it’s also details to get it ready etc. And the beat goes on……. Thanks so much for posting! Great to hear your voice.